This is a picture of our cat Riley just after a big sneeze. 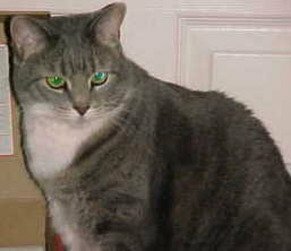 Why cats sneeze is a question that has many answers. I will review the leading causes of sneezing cats right here. Unfortunately, the reasons that a cat may do this range from the extremely minor all the way up to a sign of a serious medical condition. I will start with the worst-case scenarios to get them out of the way and work my way down to the minor reasons. We discussed this common health issue that our domestic tabby cat suffers from with the family veterinarian. I feel confident that I understand the different causes clearly. Let me share with you what I learned. 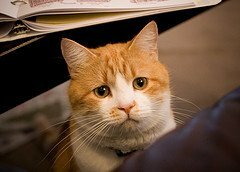 My vet states the most common cause of sneezing in cats is complications from feline herpes. If a cat contracts this disease it’s very similar to the human form of the incurable virus. Being more symptom specific, you’ll find that cats experience flare-ups and breakouts just like humans. That’s the bad news. The good news is, like the people form of the virus cats can have long periods of remission. When the herpes virus flares up it can develop sinus problems and nasal polyps that can become infected and irritated. When the sneezing is caused by this flare-up you can find extremely frequent sneezing for about a three-week period. After the flare-ups subside the pets nasal passages should return too normal. Remember a cat can live a long healthy life with this herpes virus with periods of remission so don’t be discouraged. Another common cause of why cats sneeze is the feline leukemia virus. This is another feline ailment that cats are vaccinated against. If a cat develops this disease it has a tendency to weaken the animal’s immune system. When their own natural abilities for fighting infections and irritants becomes weakened, they’re more susceptible to respiratory ailments such as sinus infections and asthma. Your veterinarian can do some blood work to determine whether your cat has this disease and recommend the best course of treatment. Although the two above-mentioned diseases are incurable the secondary ailments they cause are treatable with antibiotics. Some pet owners prefer to use homeopathic treatments that can also bring relief from these side effects or symptoms to many pets. Some animals seem to respond to these alternative treatments and others don’t. In the end you’ll have to decide what’s right for your furry child. So if your cat develops a sinus infection this condition can be highly treatable. I personally believe in many of the homeopathic treatments now available, but remember this is just my opinion and results vary depending on the root cause. Now that we have the two worst reasons why cats sneeze out of the way, we can talk about the other common feline sinus problems that do not have such serious causes and are easier to treat. We know felines use their nose to investigate and collect data on their surrounding environment. A cats nose is very sensitive and can become irritated. A cat that’s sneezing intermittently may have simply inhaled an irritant into their nasal passages during the investigation of something in their environment. Inhalation of dust and pollen can cause rapid sneezing in cats just as it does in humans. Cats can also have allergies to things like mold and food. Mold is a common reason why your cat may be sneezing. Microscopic mold spores are very irritating to both human and the kitty cats nasal passages. If you suspect your cat is investigating a moldy area you can remove the mold or restrict the cats access to this area and see if the sneezing goes away. Another cause of sneezing cats could be complications from dental related diseases. This is so common, because feline dental care is often overlooked by pet owners. If your cat’s gum’s and teeth become infected this also can affect the neighboring nasal passages. An inspection of your cat’s gum’s and teeth would be in order. You can look for redness and swelling, and also signs of tooth pain from your cat’s eating behavior. 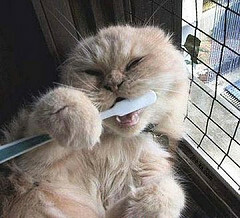 Also if your cat grabs a tooth brush and starts brushing his own teeth he may have a dental problem. Many vets offer services that include dental hygiene that can turn this condition around. Cleaning supplies can also cause the sneeze along with air fresheners, cat liter dust, perfume or cologne and many other aromatic common house hold items. So to review why cats sneeze. It is going to take some patience to get to the bottom of your particular cat’s sneezing problem. You should take the time to investigate the situation and discover the root cause just in case it is a sign of a serious condition. Out of all of the reasons mentioned about why cats sneeze in the above article only two are not completely curable. Also keep in mind that even the ones that are incurable do not mean the end of your cat’s life. With your vet’s assistance you can treat secondary infections that will improve symptoms, sooth sinus passages and can improve the over all quality of your cats life. So dig in and find out whats going on. Give this sneezing cat page a bookmark or share with a friend.